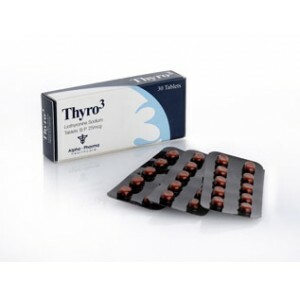 Thyro3 is a trademark and trademark for T3, which is Liothyronine Sodium. Liothyronine Sodium is a synthetic version of human thyroid hormone. It should be understood that a person’s own natural endogenously produced human thyroid hormone is actually known as triiodothyronine, which is different from Liothyronine sodium. Liothyronine is the L-isomer of triiodothyronine. Liothyronine and triiodothyronine are almost identical to each other, but Liothyronine is a more powerful option and is also better absorbed orally, so it was turned into a drug and a drug called cytomel, tyromel, terroxin, etc. T3 in the body is responsible for regulating the absorption of various nutrients in the cells and in the mitochondria of these cells in order to be effectively used for the production and consumption of energy. The mitochondria of each individual cell in the body use carbohydrates (primarily), fat, and even protein to produce an energy source known as ATP (adenosine triphosphate). Due to the consumption of more T3, this ATP production will increase, which will lead to an increase in the rate of energy consumption in the form of fats, carbohydrates and protein. Therefore, therefore, the consumption of too much T3 without the use of anabolic steroids can lead to loss of muscle mass. T3 is traditionally used during workouts, diets, or preliminary competitions to break down body fat, although in recent years Cytomel has gained some popularity as a beneficial agent in building weight (usually in combination with anabolic steroids) to better process nutrients and / or maintain body fat levels during periods of higher calorie intake. Cytomel (T3) is commonly used with anabolic steroids because of its significant effect on the body’s overall metabolism. It is very important to understand that T3 is indiscriminate in its metabolism-enhancing properties — it will increase the metabolism of fats, carbohydrates and protein equally. Therefore, beyond a certain dose of T3, there is an increased risk of muscle loss due to an increase in protein turnover. Through the use of anabolic steroids and a properly adjusted diet, this muscle loss as a result of taking T3 can be prevented. Cytomel (T3) is also usually combined with other fat reduction agents to increase its overall effect, as it works synergistically with other fat reduction agents.